Soheili, Jamalledin, Bashirzadeh, Sahar. (1394). Studying Flexibility Factor in the Architecture of Khaneh-Hussainias Using Space Syntax Theory with Approach to Social Relations, Case Study: Amini, Razavi and Akhavizadegan Khaneh-Hussainia in Qazvin. معماری و شهرسازی آرمان شهر, 8(14), 67-79. Jamalledin Soheili; Sahar Bashirzadeh. 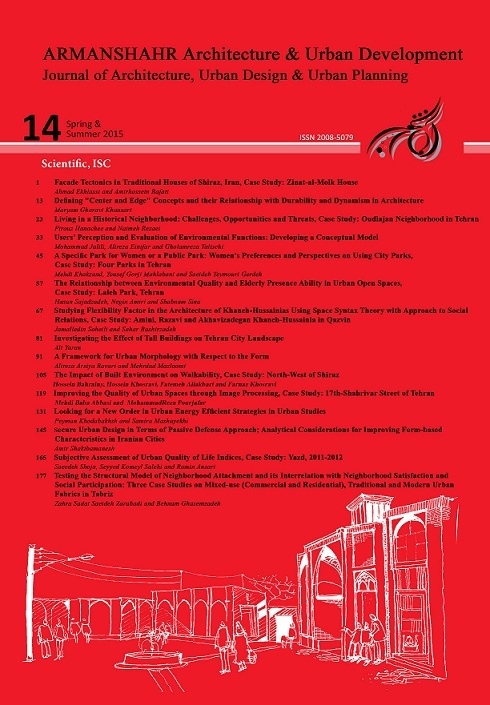 "Studying Flexibility Factor in the Architecture of Khaneh-Hussainias Using Space Syntax Theory with Approach to Social Relations, Case Study: Amini, Razavi and Akhavizadegan Khaneh-Hussainia in Qazvin". معماری و شهرسازی آرمان شهر, 8, 14, 1394, 67-79. Soheili, Jamalledin, Bashirzadeh, Sahar. (1394). 'Studying Flexibility Factor in the Architecture of Khaneh-Hussainias Using Space Syntax Theory with Approach to Social Relations, Case Study: Amini, Razavi and Akhavizadegan Khaneh-Hussainia in Qazvin', معماری و شهرسازی آرمان شهر, 8(14), pp. 67-79. Soheili, Jamalledin, Bashirzadeh, Sahar. Studying Flexibility Factor in the Architecture of Khaneh-Hussainias Using Space Syntax Theory with Approach to Social Relations, Case Study: Amini, Razavi and Akhavizadegan Khaneh-Hussainia in Qazvin. معماری و شهرسازی آرمان شهر, 1394; 8(14): 67-79. 1Assistant Professor of Architecture, Faculty of Architecture, Qazvin Branch, Islamic Azad University, Qazvin, Iran. 2Master of Architecture, Faculty of Architecture, Qazvin Branch, Islamic Azad University, Qazvin, Iran. Aminzadeh, B. (2000). Hussainias and Takaya Identifier of Iranian Urbanism. Journal of Fine Arts , 6, 55-66. Barhani Darian, F. (2007). Flexibility in the Design of Optimum Housing. Abadi , 55, 48-53. Beazly E, H. M. (1982). Living with the Desert: Working Buildings of the Iranian Plateau. Warminster:Aris and Philips Ltd.
Einifar, A. (2003). A Pattern for Analyzing Flexibility in Traditional Dwelling of Iran. Journal of Fine Arts , 13, 64-77. Einifar, A., Shaygan, H. R., & Gharipour, M. (2007). Comparative Analysid of Flexibility in the Iranian and Japanese Architecture of Housing. Abadi , 12-19. Falamaki, M. e. (1986). Vernacular Architecture. Tehran: Italian Cultural Association. Hanson, J. (1998). Decoding Homes and Houses. Cambridge: Cambridge University Press. Hillier B. (2007). Space is the Machine. Retrieved from www.spacesyntax.com. Hillier, B. a. (1984). The Social Logic of Space. Cambridge: Cambridge University Press. Hillier, B. (1997). The Reasoning Art or the Need for an Analytic Theory of Architecture. Space Syntax First International Symposium , 43-44. Ground Rules and Social Maps. Oxford: revised edition Berg. Kiani, M. (1995). Iranian Capitals. Tehran: Cultural Heritage Organization. Memarian GH, B. F. (2006). The Shared Characteristics of Iranian and Arab Courtyard House. Oxon: Taylor & Francis. Memarian GH., S. A. (2011). Application of Access Graphs and Home Culture:Examining Factors Relative to Climate and Privacy in Iranian Houses. Scientific Research and Essays , 6(30), 6350-6363. Memarian, G. (1993). An Introduction to House Typology in Iran: Courtyard Houses. Tehran: Universityof Science and Technology. Memarian, G. (1991). An Introduction to House Typology in Iran: Houses without Courtyards. Tehran:University of Science and Technology.